In my last post, I introduced The New Marketing Funnel and defined the phases of the process. In this post, I want to share how to utilize this process as the filter for every marketing action or investment you consider. One of the great advantages of The New Marketing Funnel is that it finally puts to rest the age-old question: How does the selling function differ from the marketing function and where and when do they meet. Since (what seems like) the beginning of time, sales and marketing have been in a pitchfork battle – exemplified by the Harvard Business Review article The War Between Sales and Marketing. The New Marketing Funnel clearly shows how sales fits in the marketing function and how marketing both supports and stimulates the sales function. With a clear understanding of each phase of The Funnel, the first question to ask when considering or reviewing a marketing activity or investment is which part(s) of the funnel is the activity designed to support. A fundamental key to effective marketing is to ensure that every effort is measured and assessed for effectiveness. While some marketing activities are easier to measure and judge than others, The Funnel makes it easier to assess any activity when you’re clear about it’s purpose. Take blogging for example. I’ve been a blogging advocate for years, and I’ve encouraged many a businessperson to start blogging. That said, I know many people who started blogging only to quit because, “It didn’t produce any results.” I asked them what results it was supposed to produce. After much conversation (which I might add demonstrated that they had no clear objective to begin with), it came down to: we couldn’t measure any new business we were getting as a result of blogging – it was a big waste of time. Further clarification led to the realization that they wanted their blog to support lead generation. Had they understood The New Marketing Funnel before they began to blog, they would probably have realized, before they started, that blogging would not “pay” if measured by lead generation effectiveness. (In my personal experience with this blog, I’ve found very little lead generation impact). The interesting thing about these companies is that their biggest problem wasn’t a lack of opportunities in the market, per se. The problem they had was getting prospects to understand their value proposition, and to get prospects to engage in conversation. Their direct sales efforts struggled overcoming the “relevancy barrier” (answering the question in a prospect’s mind why they should stop what they’re doing and listen to the salesperson). 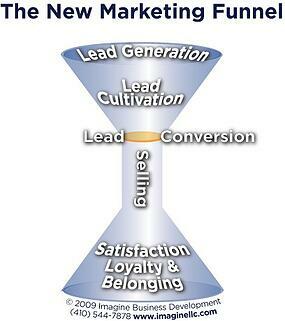 The part of The Funnel that addresses this issue is lead cultivation. Had these companies focused on the objective of lead cultivation, the topics they wrote about would have been different, the salespeople would have leveraged the content to soften the market for lead conversion and the bloggers would have given the effort the time it needed. Why? Because they would have been clear about the purpose. The Funnel doesn’t just work for blogging and other social media (though it will clearly define the power of such tools and tactics), and it doesn’t just work on the pre-sale portion of marketing. The Funnel helps direct actions that lead to increased word of mouth. Since before I ever had a thought about starting my own business (I was probably 6 at the time), I knew that the “best advertising” was word of mouth (WOM). Most small and mid-sized business enterprises (SMEs) rely on WOM for a meaningful portion of the new business efforts. Yet, few companies actually address the issue directly. The Funnel helps you focus those efforts. Identify and list all marketing activities that you conduct (big or small). Clearly connect every activity to at least one of The Funnel’s phases (it’s fine to have more than one – for example, blogging supports cultivation, selling, and loyalty & belonging for me). Any marketing activity that is not directly supporting at least one phase of The Funnel should be immediately eliminated. Describe how the activity supports the phase it has been assigned to (if you find the task of writing that description to be more pain than it’s worth – that marketing activity should be immediately eliminated). Define success – if the activity works what value would it provide; what's it worth? Calculate the costs (time, money and energy) for each activity. Do a return on costs analysis – does the definition of success (step 5) provide a reasonable multiple for the costs. Any activity that does not should be immediately eliminated. Monitor your activities and compare the results to your expectations. Identify phases of The Funnel that are not fully support and create activities that support those phases and meet the criteria in steps 1-9. If The Funnel has done it’s job, you will a) be much clearer about your marketing efforts, and b) you will have cut some marketing activities. This biggest, most common marketing mistake I see SMEs make is they try to do too much. Better to do fewer things excellently than several in a mediocre fashion. We have a tool called The Packaging Audit™ that can support this analysis. If you’d like a copy, send me an email (or leave a comment) with your contact information. I’d be happy to provide it to you.